If you are looking for things to do in Chicago with kids, then you have quite a selection to choose from. Most of the top attractions in Chicago are ideal for all ages, so finding things for children to do in Chicago won't be hard. Maybe you'll fancy a round of miniature golf in Grant Park, or perhaps you'll go to an interesting dinner show where knights in shining armor parade around an arena in grand style. These are just two ideas for fun things for kids to do in Chicago, and there are many more, so add the Windy City to your list of great family destinations, and start planning your itinerary around a few of these activities. The Shedd Aquarium, which is one of the world's largest indoor aquariums, is an attraction that should make any list of fun things for kids to do in Chicago. Here you can view sharks, rays, sea otters, dolphins, and a number of other fascinating creatures, and when you're not enjoying the exhibits, you can head to the on-site restaurant and enjoy beautiful views of Lake Michigan. You'll find the Shedd Aquarium at the Chicago Museum Campus, which is also home to the Adler Planetarium (pictured above) and the Field Museum of Natural History, both of which are also great places for families to visit.. The Lincoln Park Zoo, which is located in beautiful Lincoln Park, is one of the best city zoos in the country, and visiting it tops the list of free things to do with kids in Chicago. When you consider the quality of this small zoo, it is really amazing that no entrance fees are required. For those who are looking for things for younger children to do in Chicago, there are two sections of the Lincoln Park Zoo that might be of particular interest. They include the Pritzker Family Children's Zoo and the Farm-in-the-Zoo. Chicago is home to an array of inviting parks, and taking the kids to one of them when the weather is nice is always a good idea. Lincoln Park, which covers 1,200 acres, is the largest and most complete park in Chicago, so you might head there first. Both Grant Park and Millennium Park also beg a visit when looking for fun things for kids to do in Chicago. When it gets really hot in Chicago, the kids will love the fountains at Millennium Park. During the summer in Chicago, the city beaches that lie along the shores of Lake Michigan are quite popular. 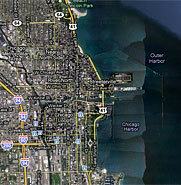 The North Street Beach is widely considered the premier beach in Chicago, as it offers the most complete facilities. It's not the only beach you should consider visiting in Chicago, however, as there are plenty of good ones. Some even boast some good sand, and you can bet that building sandcastles will a be a hit when it comes to things to do in Chicago with kids. No visit to Chicago would be complete without a trip to Navy Pier, which is a 3,000-foot pier that was built during World War I. There's always something going on here, and the carnival-like setting is something that kids are bound to enjoy. Navy Pier is home to the Chicago Children's Museum, a fifteen-story Ferris wheel and other fun rides, and a 3-D IMAX theater, among other things, so it's definitely a good place to visit when looking for things for children to do in Chicago. Chicago has been experiencing a rebirth of sorts when it comes to local theater, and often the top Chicago theaters put on child-friendly shows that you can add to your list of things to do in Chicago with kids. In addition to considering shows on your next family trip to Chicago, you might also check the schedule as it pertains to local events, as plenty of annual festivities in Chicago are centered on family fun. As long as no one in your group is afraid of heights, heading up to the Hancock Observatory is something you might add to your list of things to do in Chicago with kids. This observatory is housed in the lofty Hancock Building, which is the fourth-tallest building in the city. The views are amazing from the observatory, as you'll be almost 1,000 feet off the ground, and if you're daring enough, you can check out the Skywalk open-air viewing deck. You might also consider visiting the 95th-floor restaurant, where you can grab a meal or some snacks while you enjoy the views. If you're looking for a day trip out of Chicago, this amusement park, which is bound to put some smiles on the faces of every person in your group, is ideally located. The park is midway between Chicago and Milwaukee, and you can bet that it's a family favorite in both cities. The drive from Chicago to Gurnee, which is the Illinois town in which Six Flags Great America can be found, will take you about 45 minutes, and it could hardly be any easier since it's right off of I-94. More than 100 rides and attractions await you here, and if you like roller coasters, there are no fewer than ten to enjoy.